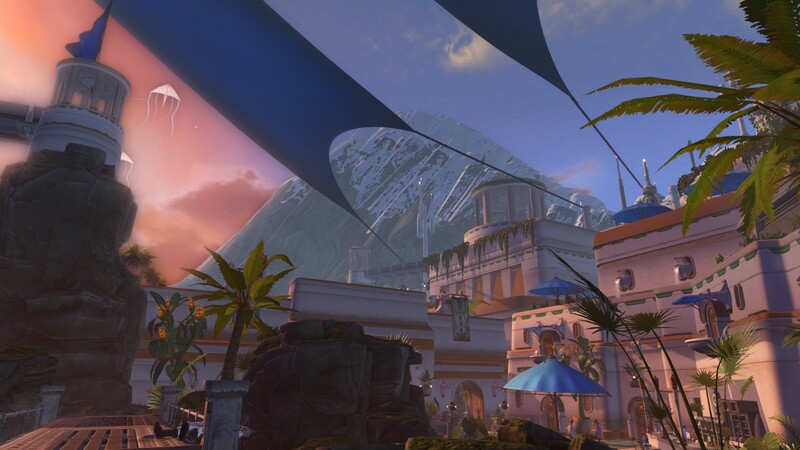 Man, what’s going on with SWTOR? They seemed to be on such a roll there with Fallen Empire and Eternal Throne. Two great expansions in rapid succession that seemed highly successful by just about every possible measure. But now I return to the game after nearly a year away, and it seems to be floundering, with barely a trickle of new story added since I left. Do note this post will contain spoilers for Knights of the Eternal Throne and the recent patches. It’s not that I don’t like the new story. It’s imperfect, but it’s got a lot going for it. I do give Bioware major points to finding a way to bring drama to the story after effectively painting themselves into a corner with the ending to Eternal Throne. At this point, the player is the most powerful person in the galaxy, commanding an army that no force in existence has yet been able to beat. It’s hard to make a dramatic story in that context. The War for Iokath suffered from this. Why am I wasting time fighting a ground war against the Republic when I can just threaten to wipe Coruscant off the map with the Eternal Fleet? There’s pretty much only one thing left that can threaten the Eternal Alliance: a betrayal from within its own ranks. And very wisely, that’s exactly what Bioware has thrown at us. Unfortunately, I had the traitor’s identity spoiled for me, so the reveal didn’t have much drama, but I still think making Theron the traitor is an interesting path to take. More than anything else, I admire the sheer gutsiness of it. Theron’s been around for a long time. People have put a lot of effort into grinding influence for him. Many people have even romanced him. I feel really bad for those people — I’d be losing it if Lana had been the traitor — but at the same time I can’t help but admire Bioware for being willing to take such a huge risk. No sacrificing good story for the sake of gameplay here. It fits well with my own RP, too. As a player, I’ve never had any strong feelings one way or another on Theron, but my agent has always hated him. This is due to a combination of the traumatic experiences she’s had at the hands of other Republic spies and his close relationship with Lana — Cipher Nine is the jealous type. So having Theron now turn traitor is a great escalation of the tension that’s always existed between them. Also, speaking of Lana, I was pleasantly surprised by the amount of romance content in recent patches. I mean, it’s not a lot, but it’s more than I expected, and it’s well done. I think I might need to reexamine my views on relationships, because I think Lana’s bloodthirsty tirade about the wrath and ruin she’ll bring down on anyone who hurts me is just about the sweetest thing I’ve ever seen. It’s an interesting story, but the trouble is there’s just so little of it. Each of the three major content patches since I played last contains roughly an hour of new story. Even TSW, at least prior to the pre-reboot drought, was putting out more content than this. Also, we need to talk about Copero. Man, that was a disappointment. As a Chiss main, I was really looking forward to finally getting to know Cipher Nine’s people. Not being a big Star Wars fan, I know very little about the Chiss, and I’ve always regretted being so ignorant of my own character’s origins. But the Copero flashpoint and accompanying story tells us pretty much nothing about the Chiss, their history, their culture, or why they’re the only society in history the Sith have chosen as allies. They’re just a different color of trash mob to mow down. On that note, it also needs to be said Copero is an absolutely miserable experience from a gameplay perspective. 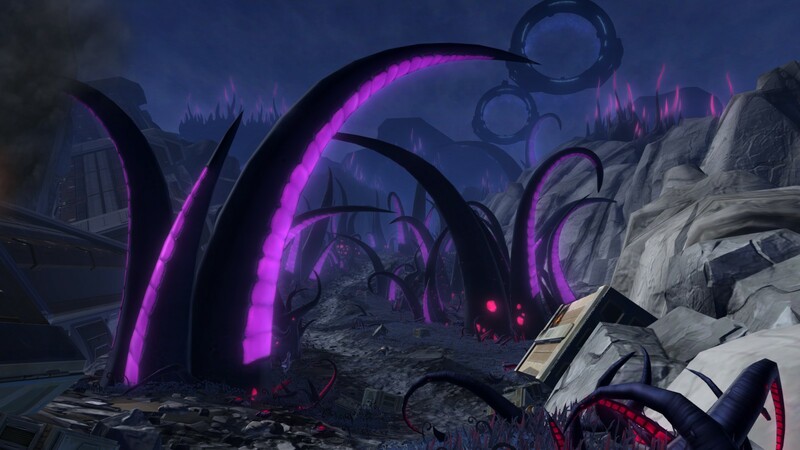 Umbara was pretty good, and I thought maybe Bioware was finally figuring out how to do fun dungeons, but Copero is a long, long slog through endless trash mobs and bosses that have about twice as much health as they should. It was painful — actually painful; my fingers were getting sore by the end. To make matters worse, I had to do it twice. For some reason story mode and solo mode are separate this time, and I made the mistake of doing story mode first, which doesn’t count for the story mission. I therefore had to pick up the actual story mode (which is called solo mode) and do it all over again. I feel a bit dumb, but based on general chat, I am far from the only person to make that mistake. Oh, and there’s no recognition at all that I’m playing a Chiss. 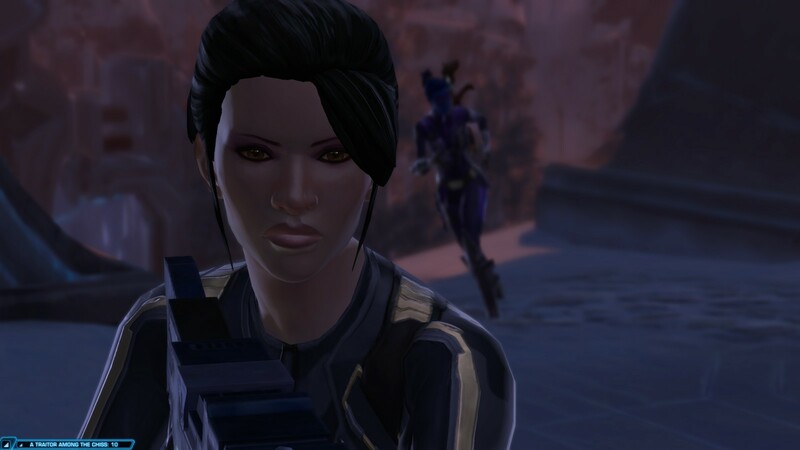 Racial content is usually very minimal in SWTOR, so I wasn’t expecting much, but at least a few dialogue tweaks would have been nice. It’s weird having all the Chiss treating my Chiss as an outsider. At least Raina’s back. She was one the last missing companions I really wanted back — just waiting on Nadia now. Although it was too short as always, I did really enjoy seeing her and Cipher Nine catch up. That was a very real feeling moment. I’ve always liked their relationship. Because at face value, it looks like SWTOR reinvented itself for the better only to squander all its momentum and faceplant once again. This entry was posted in Games and tagged sci-fi, Star Wars, Star Wars: The Old Republic by Tyler F.M. Edwards. Bookmark the permalink. It’s interesting to see your perspective of “KotFE and KotET were so great, why the decline now”, because in the community of dedicated long-time players a lot of people were feeling the opposite: that the complete focus on single-player story at the expense of all else was harming the game and slowly causing the servers to depopulate. Therefore the change in direction at the start of the year was generally welcomed. Less time spent on story means there is once again time to pay attention to game modes like Galactic Starfighter or operations, which previously hadn’t received any new content updates in 3 years or so. The latest patch also overhauled the group finder interface for example, and the recently completed server merges clearly also took a lot of work in the background to make sure everything slid into place smoothly. Umbara also had a separate story and repeatable solo mode by the way, but I think there the naming was (appropriately) the other way round. The way they did it this time sure confused a lot of people. 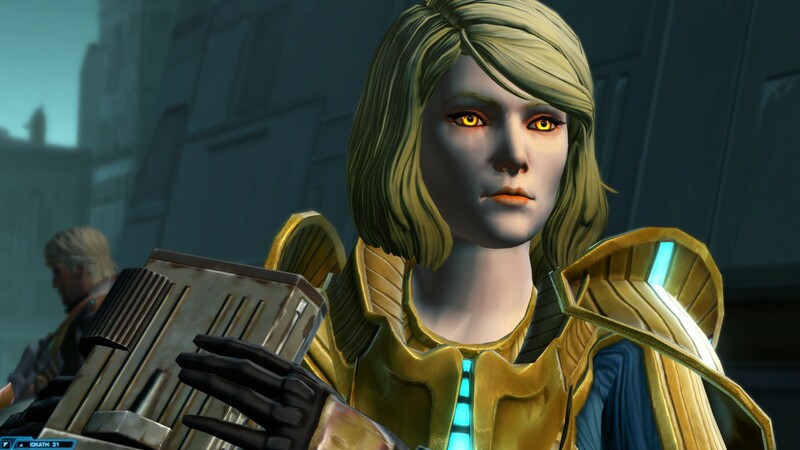 Admittedly I’m not massively engaged in the SWTOR community, but from what I’ve seen the recent endgame additions have still been nowhere near enough to satisfy that crowd. The Knights expansions seemed to me to be doubling down on what the game does best, and that focus yielded great results, whereas the last year seems to be an exercise in trying to please everyone and ultimately pleasing no one. The scattershot approach to MMO design never goes well. Unless you’re Blizzard, anyway. Well, in terms of results, only Bioware/EA really know just how well KotFE and KotET did. I suspect that after KotFE’s initially strong lauch, things can’t have looked that rosy, or else they wouldn’t have started backpedalling after a little over a year. And I strongly disagree that MMOs should just focus on one thing. Why have an MMO at all if you’re going to do nothing but single-player updates? If you’re a one-trick pony, there is usually some other genre that does that one thing better anyway. Content diversity is a big part of an MMO’s appeal. A little variety is okay, but MMOs trying to be all things to all people is how we got years of bland WoW clones that were completely interchangeable with each other. I’d rather my games have some identity. That’s not to say that a game should only ever do one thing, but it should never reach a point where you’re compromising what your game does best for something that other games always have and always will do far better.